Bespoke slipcases can be manufactured from PVC, polypropylene or paper over board and can be made to suit your size requirement. 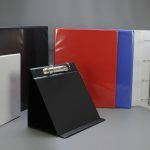 PVC construction slipcases can be made from a range of vinyl colours, to which we stock 35 colours. More colours and textures are available subject to minimum quantities. Polypropylene constructed slipcases are die cut and creased to your size and shape required. They are usually manufactured from 800 micron or 1200 micron polypropylene sheets. Stock materials we hold are a frosted clear effect and white. The polypropylene slipcases are made in the flat and can be supplied made up or flat for self assembly. Paper over board constructed slipcases are die cut and creased to your size and shape required. These are made from 2250 micron board and then covered with your printed paper design.